If you don’t want to spend another holiday season with your worn-out kitchen floor, but the timing’s not right for a full makeover, here’s a quick fix. 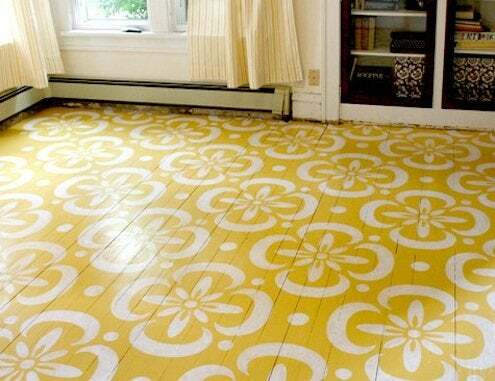 Painted and stenciled floors have been the thrifty décor solution for high-traffic areas since colonial times. You can paint over concrete floors, any sort of wood floor you’d rather not refinish, or peel up old sheet goods, sand and paint right over the plywood underlayment, as long as it’s in good shape. There are great stencil design ideas online, or adapt your own from patterns in your wallpaper, drapes or upholstery fabrics. For simple geometric designs, with little more than a chalk line and some painter’s tape, you can create the look of an area rug with a border, checkerboard marble, stripes, damask or brocade, depending on what strikes your fancy. Stenciled designs are especially practical in hallways, kitchens, and kids’ rooms since, unlike real carpet, you can sweep or mop them in a flash. Best part is, if you don’t like it next year, you can paint right over it with something new!